Murmansk, a region just shy of the Arctic Circle, has its share of both global and local ecological challenges. A major centre of heavy industry, Murmansk has a high level of environmental contamination and, like many regions, it faces a dilemma: its industrial plants are both the basis of the local economy and the chief polluters of its air, water and soil. The most prominent of these polluters is the Pechenganikel mining and smelting complex, part of the Kola Mining and Metallurgical Company, a division of Norilsk Nickel, which supplies about 20 per cent of the world’s nickel. There are regular disputes with neighbouring Scandinavian countries over toxic substances drifting across their borders, and Bellona-Murmansk, a local environmental organisation, claims that Pechenganikel contravenes regulations on maximum permitted emissions. The company’s management denies this, and their statements are confirmed by checks carried out by various state bodies. There is, however, some doubt as to the objectivity of such checks given that the inspectors confer with management on their timing. Russia’s Meteorological Centre has also recorded a high concentration of sulphur dioxide in the air around the complex, evidence that maximum permitted emission rules are indeed being contravened. Government inspectors confer with company management on the timing of checks. In general, the land around the plant has a lifeless air, like a scene from a post-apocalyptic film. Even if all emissions were to be halted immediately, the local environment would take a long time to recover and a huge amount of work to make it productive again. Over the last three years, toxic emissions from industrial plants in Murmansk have led to an increase in the contamination of the atmosphere by suspended matter and carbon monoxide. Some water sites near the metallurgical complex are chronically heavily polluted. In 22 bodies of water, 165 instances of high, and 45 of extremely high levels of typical indicators such as nickel, molybdenum, copper, sulphates, flotation reagents, nitrogen compounds and organic and other substances have been recorded. The state of the topsoil in industrial areas of places like Monchegorsk, Zapolyarnny and Nickel also falls short of public health standards. 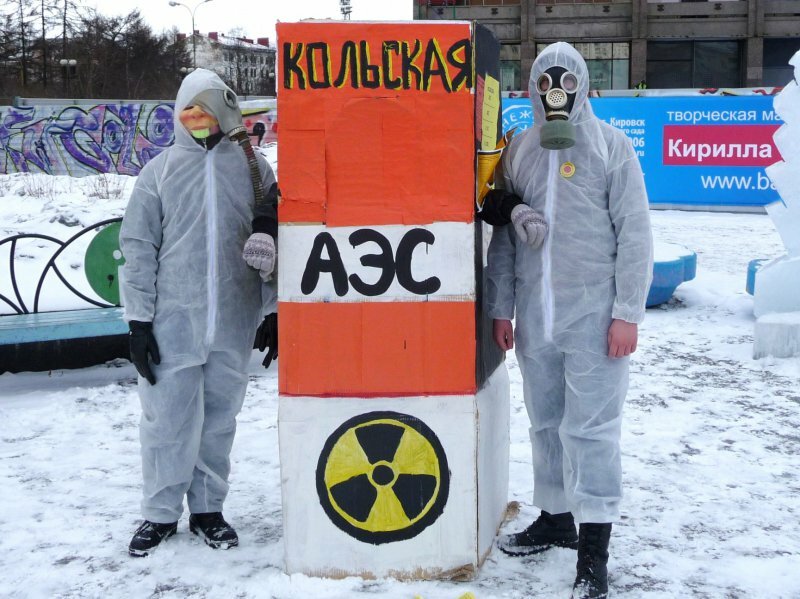 In terms of environmental safety, the distinctive feature of the Murmansk region is the fact that the Kola Peninsula has a high concentration of radiation hazardous installations. The town of Polyarnye Zory houses the Kola nuclear power plant, whose four reactors are well past their projected lifespan (the first was commissioned in 1973). There have been no government checks on the impact of the plant on the local environment, and the reactors work above their quota, at 104-108 per cent of their recommended load. Action by 'Nature and Youth', 22 November, Murmansk. Photo: Nature and YouthAnd that isn’t the whole story, either. The reactors are not encased in containment domes that would prevent the emission of radioactive substances into the atmosphere, and their cooling systems are considered unsafe. The spent nuclear fuel is sent to the Mayak plant in the Urals for reprocessing, which also involves the dumping of radioactive waste in reservoirs. Discussions are currently taking place about building a second nuclear power plant here, with governor Marina Kovtun giving her personal assurance that this will happen. However, there is still some hope that common sense will triumph: the Kola Peninsula offers enormous opportunities for harnessing renewable energy sources, and these too are being discussed, albeit less vigorously. In Russia, and Murmansk, in particular, the climate change movement is only just beginning to take shape. Here, the ‘abstract’ nature of climate change—the fact that its impact isn’t obvious to the general public—is the main reason climate isn’t on the table. Urban dwellers especially see the issue as something unreal, or so complex that they have no motivation to start doing anything about it. It is difficult to galvanise people to get involved in what little anti-climate change action there is. Murmansk’s nuclear reactors are well past their use by date. But that doesn’t mean that nothing is happening. 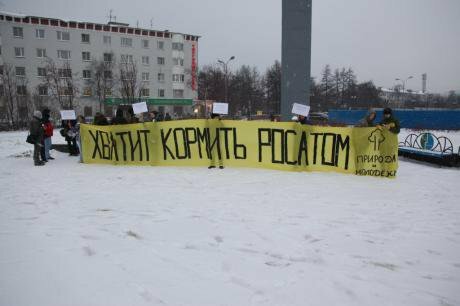 Grassroots work is going on in various regions of Russia, including Murmansk. The Russian Socio-Ecological Union (SEU), for example, has been working for a long time, developing networks of climate activists and information resources for NGOs working in the area. Campaigners from small regional NGOs are involved in publicising initiatives designed not only to change prevailing attitudes towards climate change, but also to change people’s behaviour and encourage climate-friendly habits. For example, in the run up to the COP21 talk in Paris, the Nature and Youth and Aetas organisations worked to mobilise people in the Murmansk and Arkhangelsk by holding meetings and activities to inform the public about upcoming events of global significance. The Murmansk organisation Nature and Youth runs regular international environmental camps based on the principle ‘Think globally, act locally’, encouraging people to reject short-sighted carbon-heavy policy and switch to renewable sources of energy and energy conservation measures. The organisation also runs the ‘Barents Sea Eco-Art Academy’, an educational platform for projects at the interface of ecology and art, with specialists in different areas working with artists to enhance the impact and effectiveness of solutions to environmental problems. Young people are a particular target. Regular Youth Climate Forums bring together environmental campaigners, members of small indigenous peoples and interested members of the public. The eco-activists work with schoolchildren and students to encourage eco-friendly habits in the rising generation and reduce our carbon footprint—an effective way of attracting more people who are ready to make practical changes in their lives. New laws passed in Russia to restrict freedom of speech, assembly and association have, however, made environmental and climate change activism more difficult. Environmentalists in chemical protective suits during a protest, 2011. Photo: Youth and NatureProtest activity among many environmental NGOs has been reduced to a minimum: 21 environmental organisations have had to register as ‘foreign agents’ because they engage in so-called ‘political activity’ and receive funding from abroad. The Bellona-Murmansk organisation, for example, was registered on the Foreign Agent List after it produced a report on industrial pollution in the Barents Sea. As a result, it is becoming almost impossible for these organisations to receive any funding. Some NGOs have closed down, others are trying to overturn their designation as ‘foreign agents’, but for the moment their activity is mostly restricted to matters unconnected with the environment, which has had a big impact on the effectiveness of the anti-climate change movement. The government clampdown on environmental activism has, to a large extent, been made possible by the mindset of the Russian public. People are used to having everything done for them by the authorities, but if the authorities fail to sort something out, the eco-activists and human rights campaigners are expected to take responsibility. Thus, a contradiction of sorts: the authorities are happy to have some kind of civil society that can deal with its own problems, but, at the same time, they promote the philosophy of hyper-consumption and the principle of ‘every person for themselves’, which entrenches social problems and tensions in Russian society. Meanwhile, the elites don’t want to use their capital to solve social problems. Today there are only a handful of socially responsible entrepreneurs – most only think about how they can get richer, and not about the harm they cause to the environment. All these factors contribute to people’s belief that nothing can be changed. When environmentalists try to persuade people to be more conscious of their consumption, people refer to the state’s lacklustre approach to industrial pollution and the effect of big business on our environment and climate to excuse their own inertia. People behave like sheep, only changing their habits when others do it as well. You can persuade a few people to follow your own example, but by the time everyone catches on, it’ll be too late to save the earth’s climate. Global events such as the Paris talks could have provided the impetus for increasing public awareness of environmental issues. A burst of activity, media coverage, parallel local events and a general sense of identification with the problem could have shown that the government, the elites and a huge number of ordinary Russians were ready to make changes to their lives to save the planet. However, in a country where the government is prepared to deprive its citizens of their rights and freedoms for the benefit of the political elite, this kind of citizen mobilisation is merely a dream. All we can hope for is that the Paris summit will take positive decisions that can influence our leaders. Environmental organisations here still have a long way to go before they can persuade their fellow Russians to embrace change.